How to install the Enterprise Version of WiKID's two-factor authentication server from networking to adding a user: User management and the example.jsp page. Now that you have created a Domain and a Network, client you will need to set up Users to test the system. We will manually configure a user. Of course, one of the major benefits of using WiKID is the automated initial validation system. We provide you with example scripts that show how your users to easily configure WiKID themselves. First, click on the Users tab. Start your WiKID software token on your PC ($ java -jar wikidtoken.x.x.x.jar for example) and enter the domain code you created earlier. You will be prompted to enter and verify a PIN. You will receive a Registration Code back. This code is only used once during the initial validation process. On the WiKID User Management screen, click on Manually Validate a User and you will see the registration code listed. By default a registration code can be validated any time within 24 hours after it is created. The administrator can control this lifetime by changing the UnRegDeviceTTL value in the Parameter Settings (it is listed in minutes). Click on the registration code. Once you have selected the correct Registration Code, enter the appropriate user name (that - not 'username' ;-). Returning to the main User Management screen will show the validated user. Congratulations. 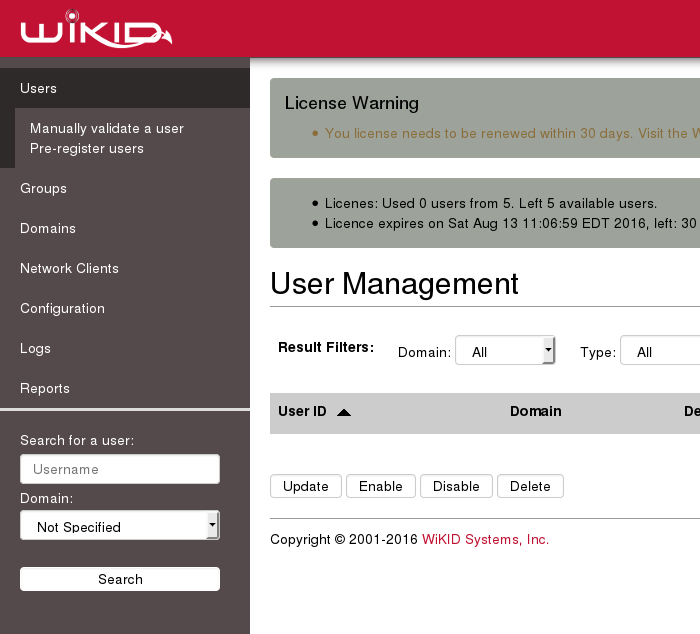 You have now configured the WiKID Strong Authentication Server. You should be able to test your set up by logging in to your network client using the username and one-time passcode from the WiKID token. If you have issues with RADIUS, please see this document on troubleshooting radius issues. From here, you can see our extensive collection of documents on adding two-factor authentication to a variety of services and VPNs. Once everything is working, you can get a permanent certifcate from our licensing/certificate server.